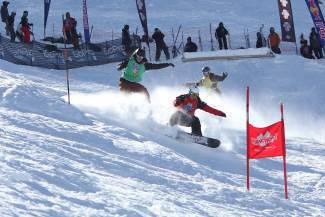 Competitors take part in a previous Rahlves' Banzai Tour at Kirkwood Mountain Resort. The first stop of the Rahlves’ Banzai Tour took place in unseasonably warm conditions at Kirkwood this past weekend. 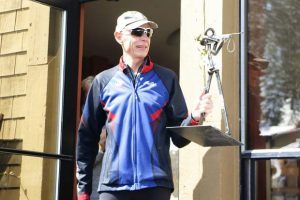 After preliminary time trials on Saturday, the final rounds started around 11:30 a.m. Sunday under cloudless skies and temperatures reaching the high 50s. Spectators took in the action from the top of The Reut lift, where they had a clear view of the Alaska Airlines “flight deck,” one of the jumps on the course where competitors could show off. The person with the biggest air won $100 in Alaska Airline bucks. 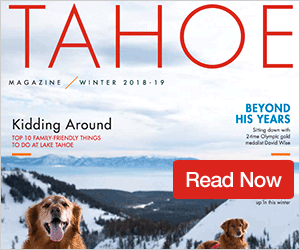 Founded by former Olympic ski racer Daron Rahlves of Truckee, the tour is a mix of big-mountain freeriding and skicross and snowboardcross, with up to four competitors racing head-to-head in each heat in hopes of winning a piece of the $15,000 prize purse split among the top finishers. The course, which started at the top of The Wall and ended at the bottom of Buckboard, was in good condition on the sunny day of racing. “Considering what a low snow year it’s been, it was awesome,” Lucas said. Lucas finished runner-up to Squaw Valley big-mountain pro Iris Lazzareschi in the women’s snowboard final. Lindsay Wexler rounded out the top three and Audrey Hebert was fourth. In the men’s ski division, Kyle Coxen claimed the top spot in the final four-person heat to earn the winner’s prize purse and a shot at racing Rahlves in the Super Final at Sugar Bowl on March 16. Shawn McGee finished second and Josh Anderson third, while Daniel Zeffaro was fourth. In addition to his win, Coxen also won biggest air and $100 toward an Alaska Airlines flight with a spread eagle off the flight deck. Former World Cup moguls skier Shelly Robertson of the Squaw Valley Freestyle Team and Shannon Rahlves, sister of Daron Rahlves, finished 1-2 in the women’s ski division. Their top results came as no surprise, as the two have battled for the win on multiple occasions since the Rahlves Banzai Tour began in 2009. Whitney Gardner finished third and Katie Wry fourth. In the men’s snowboard division, regular top contender Sylvain Duclos captured the win and was followed by Sierraville native Jayson Hale in second, Bobby Minghini in third and Lucas Dehmlow in fourth. Duclos’ win earned him a shot at racing Olympic snowboardcross rider Nate Holland in the inaugural snowboard Super Final in the final stop at Sugar Bowl. 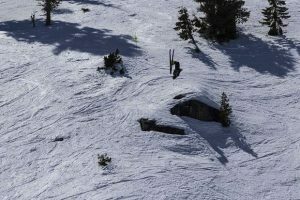 The Rahlves’ Banzai Tour continues at Squaw Valley on March 1-2, Alpine Meadows on March 8-9 and Sugar Bowl on March 15-16. 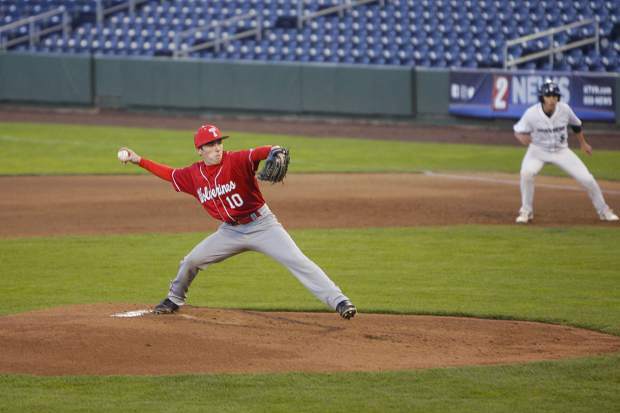 — Sierra Sun Sports Editor Sylas Wright contributed to this report.